You can use the WiFi menu to quickly connect to a nearby wireless network. The strength of each nearby network is shown next to its name. Those networks with darker bars indicate a stronger connection. 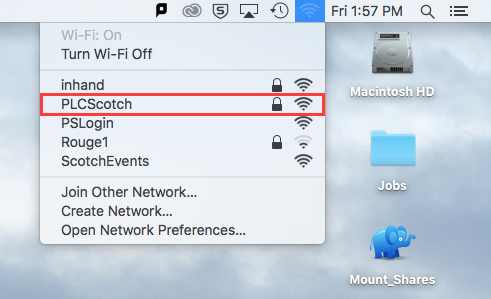 If you don't see the PLCScotch network listed, check if others nearby can connect to it. If they are getting a signal and you're not, turn your Wi-Fi Off then On again. You could also try Restarting the Computer. If neither of those approaches work, go see 1Degree. Click the Wi-Fi icon in the menu bar and make sure that WiFi is on. Select the PLCScotch network from the list. Enter your User ID and Password and your WiFi should connect.